This historic apartment is part of an ancient Convent that has a long and fascinating history. It has been restored with rustic simplicity by two famous Italian architects. It's an open space perfect to spend unforgettable holidays and can accommodate up to 4 guests, ideally a couple or 2 people and 2 children. It is placed in Tropea city centre but just 5/10 minutes walking from the beach. Tropea is located on an imposing sandstone crag in a magnificent position between Sant'Eufemia and Gioia Tauro. It is one of the most picturesque and artistically interesting centres in Calabria, commanding magnificent views of the sea, beaches and coves. Condé-Nast Traveller recommended. I'm the owner of several holidays apartments in Tropea, since 2002. I know what tourists look for their holidays and I want to help them to enjoy the time spent with us. 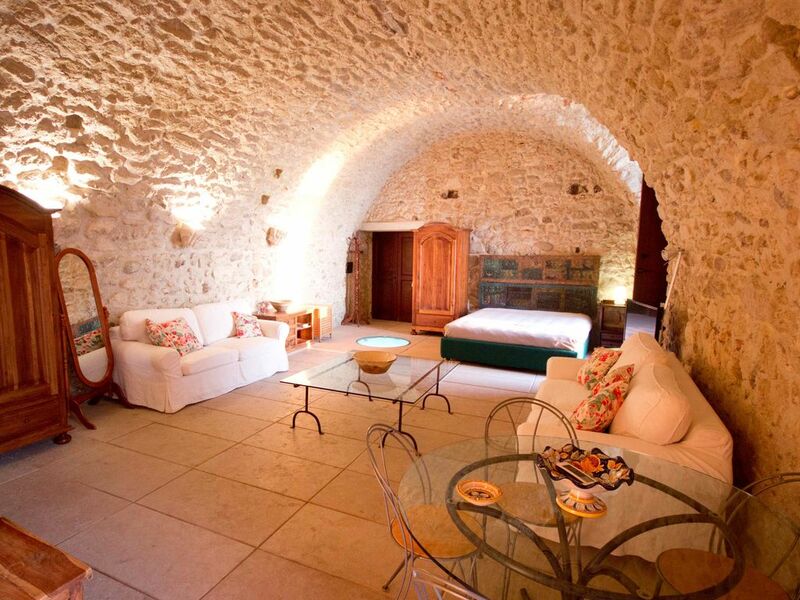 This historic apartment is part of an ancient Convent that has a long and fascinating history. It has been restored with rustic simplicity by two famous Italian architects. It's an open space perfect to spend unforgettable holidays and can accommodate up to 4 guests, ideally a couple or 2 people and 2 children. It is placed in Tropea city centre but just 5/10 minutes walking from the beach. Tropea is located on an imposing sandstone crag in a magnificent position between Sant'Eufemia and Gioia Tauro. It is one of the most picturesque and artistically interesting centres in Calabria, commanding magnificent views of the sea, beaches and coves. Condé-Nast Traveller recommended. Amazing sea view in an unique historic restored building. Comfortable seating and 2 balconies. TV and CD player. Not just one, but 2 amazing terraces for unforgettable moments. Golf Club Feudo Montalto: The golf club Feudo Montalto is located in Limbadi, 30 km far from Tropea. The golf court is composed by 9 holes it has wonderful views. Notes on accommodation: Open space apartment Outside: There is a shared patio. There are two terraces in front of the sea and the magnificent view on the Church of Santa Maria dell'Isola. Cleaning / Towels / Linen / Maid service: Weekly cleaning and linen change. A car is not necessary to enjoy Tropea and its beautiful beaches, although it is recommended to explore the nice surrounding areas like Capo Vaticano. Everything you need in town is within five minutes walking and the train station is within 15 minutes on foot. The marvellous coast, the ancient Greeks' cities, the mountains and even Sicily are all within day trip range. The car ferry at Villa San Giovanni allows you to reach Messina, Sicily in just 90 minutes and from there Taormina is only 45 minutes away. Tropea has very ancient origins indeed, its area has conspicuous traces of prehistoric settlements and evidence of Greek and Roman presence. Tropea is also an active farming centre, famous for the excellent quality of its food produce. Finally, the town´s craft production and cookery are also noteworthy, the latter is, above all, distinguished for its seafood tradition. Notes on prices: The prices displayed are provisional, please contact us for more detailed quotes.